Maybe this has been brought up before, and if so, I apologize. 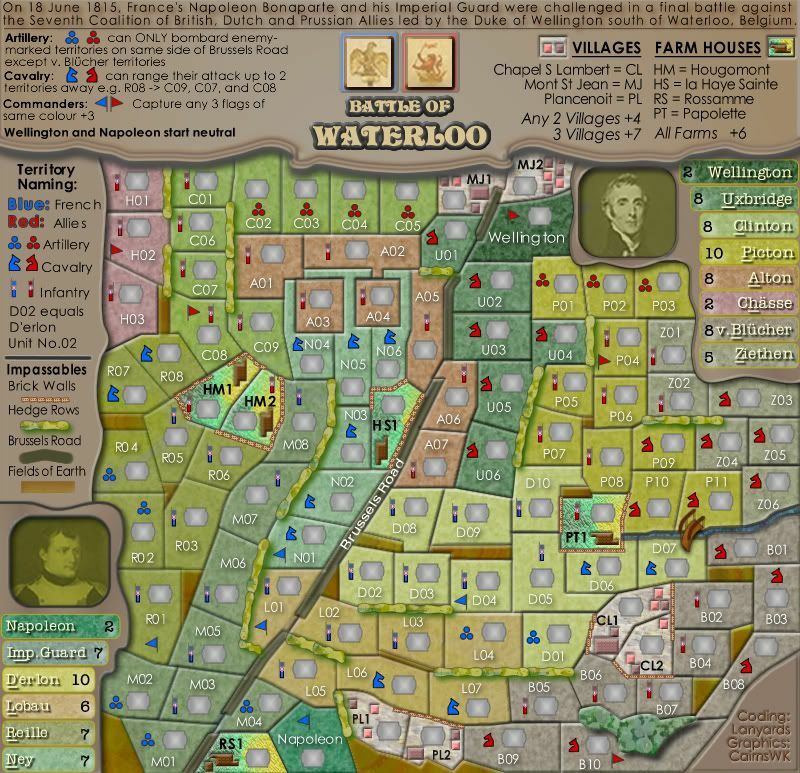 I have been playing on this site for a short time, and I fell into a "trap" as well as a few others that I have seen playing the Waterloo map (which I think is a great map). and, I never said it would be changed, I just told him where his suggestion goes. 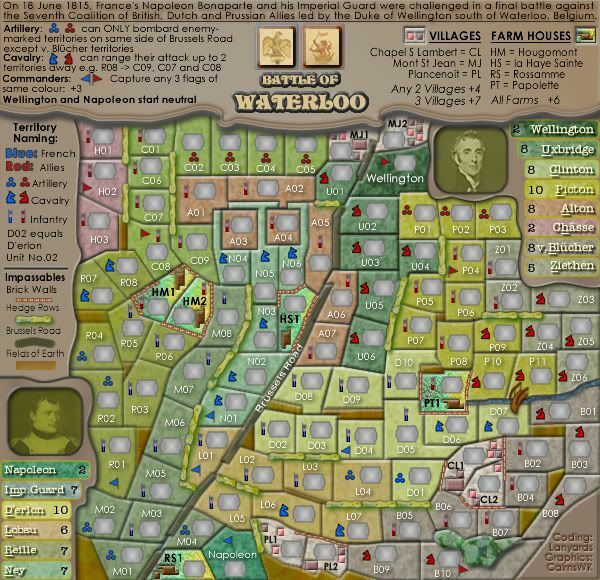 waterloo=the best map ever thats part of the strategy of it how many you drop on the bombarders since if you put to many you cant get them back and if you put to few you run into problems that way. I tried to point that out as a problem (that it be better explained) when it FIRST came out, but I was told by the creator that he did not think it was a problem. That was several months ago. Uxbridge 04 looks like it touches Picton 02 (it's got a single pixel overlap), but it's not directly connected in the xml. Any chance of moving the hedge over a smidgen? BaldAdonis wrote: Uxbridge 04 looks like it touches Picton 02 (it's got a single pixel overlap), but it's not directly connected in the xml. Any chance of moving the hedge over a smidgen? Very nice. Fixed up a few other slightly ambiguous parts as well. Firstly I love this map, but one question. The bonus values seem very arbitrary. I have no idea why uxbridge is an 8 while Ziethen is a 5 for example. For the artillery bombardments, what does it mean by "marked territories"? Joodoo wrote: For the artillery bombardments, what does it mean by "marked territories"? does that mean if you hold an artillery territory, you can bombard all enemy territories except for Wellington/Napoleon? Joodoo wrote: does that mean if you hold an artillery territory, you can bombard all enemy territories except for Wellington/Napoleon? Below is part of the xml for the territory M01 - Imperial Guard 1. As you can see it can bombard a lot of territories that are marked as the opposition. Territories with some kind of Soldier icon infantry/cavalry/artillery. Some have none, eg the villages, so these cannot be bombarded. Ogrecrusher wrote: Firstly I love this map, but one question. The bonus values seem very arbitrary. I have no idea why uxbridge is an 8 while Ziethen is a 5 for example. Well the record should be in the thread if you want to check. hi. you guys need to post more of the rules for this map. such as that an artillery space can't attack any space which belongs to the the same region as itself. sm8900 wrote: hi. you guys need to post more of the rules for this map. such as that an artillery space can't attack any space which belongs to the the same region as itself. wow, quick reply. thanks very much. not to be nit-picky, but what about the above-quoted post? I didn't see a reply to that one. thanks. I have to ask sm8900, when playing a map that is essentially a two-sided game, why would you want to attack your own space. I can see what you're getting at though. This was the way the map was designed. Tho that does give me an idea... since CC still doesn't have proper map guides, it might not be a bad idea to have a FAQ for a given complex map in the first post of the thread (especially since now there's a link to the development thread in each map's game finder image). um I would want to attack a space in the same region if it is held by the other side.